Shahrak is one of many areas in Balochistan province that lack basic healthcare facilities. It is a small town of Ketch district in southern part of the province. 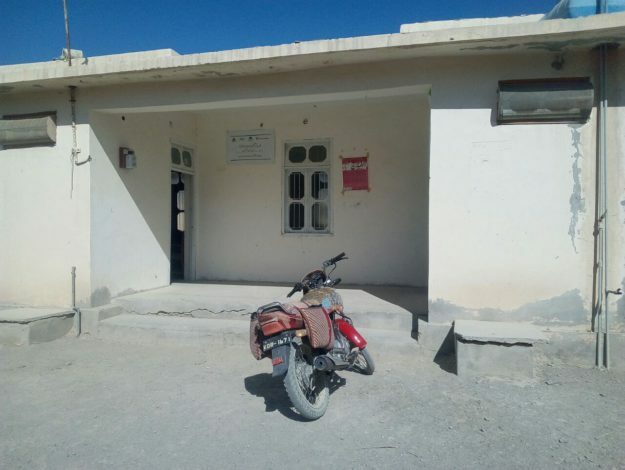 The only public dispensary building in Shahrak, meant to cater to the medical needs of the residents of the town and its four adjacent villages is devoid of a doctor, medicines, and other facilities. In the absence of hospitals and clinics, the dispensary is the only recourse available to provide medical care to the population of 7,500 people. In case of an emergency, the people rush to Turbat city; the nearest destination which is 32 kilometers away from Shahrak. The fortunate ones make it to the hospital while others suffer from pain or lose their life. Most of the people who are striving to make ends meet, cannot afford to travel to Turbat. Residents believe that maternal mortality rate has been on the rise since last few years. There is no formal record to substantiate the claim but the ground realities don’t suggest otherwise either. In place of a doctor, the district government has recruited two medical technicians for the dispensary who are performing the duties of a doctor. Medical technicians who essentially work in several areas of a clinical laboratory are out of place in Shahrak dispensary which doesn’t offer such services. Hameed Qadir, a medical technician employed in Shahrak dispensary, while stressing on the need for a doctor told PakVoices that he is compelled to treat patients even those in critical condition. On the other hand, the District Health Officer Turbat, Dr. Farooq Rind is unaware of the realities that people of Shahrak endure on daily basis. He confidently claimed before this scribe that the district government has furnished the dispensary with every basic medical facility. Whereas the ground reality suggests that the dispensary is not even furnished with medicines and the residents of Shahrak and its four adjacent villages have to travel to Turbat city for medicines.